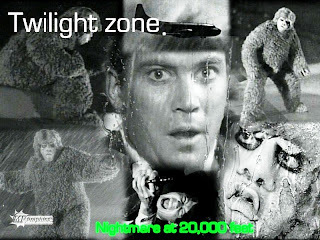 Rod Serling's classic science fiction television show, The Twilight Zone, first premiered 50 years ago today. It is still seen in syndication. I am showing one of the most famous episodes from this series, Nightmare at 20,000 Feet, from 1963, starring a very handsome William Shatner. You can turn the music off on the top left if you want to watch this video.